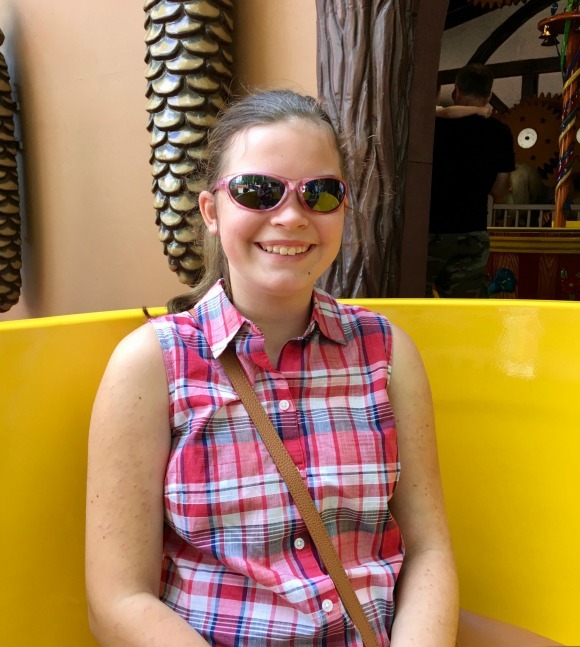 Stacy Tilton Reviews: Story Land - making children's stories come to life! Story Land - making children's stories come to life! 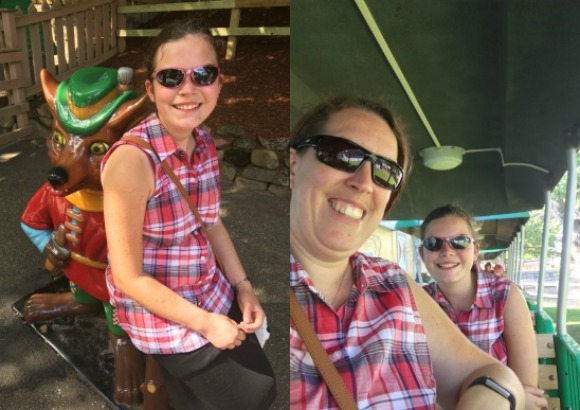 If you missed my previous post I had mentioned that after twelve years and another child later we were headed back to Story Land to make some new memories. So fast forward to 2017 and here we are again! I will be honest not alot changed over those twelve years. There is a neat new wooden roller coaster, but for the most part everything was just as I remembered it when we took our son. Of course the best part is that we have our daughter now to enjoy it all over again with. As you can see by her smile she enjoyed herself. As soon as we entered the park she immediately started off towards rides. She wanted to make sure she got to ride everything at least once. One of the rides she managed to ride more than once was the Antique German Carousel. She loves horses so I knew she would enjoy the carousel. Plus it was a really neat version because you got to make your horse rock back and forth instead of it going up and down like traditional carousels. 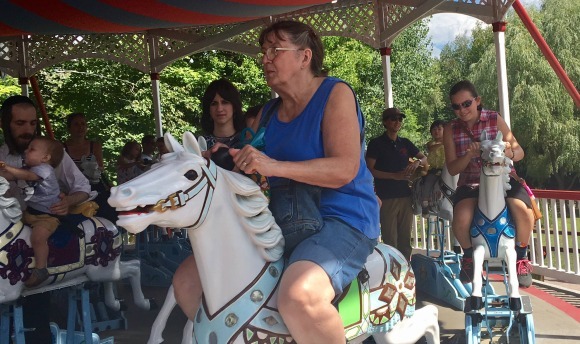 She even got the chance to ride it with her grandma (in blue). What a fun way to make memories! Through out the park there were lots of statues of various fairy-tale characters. It gave you lots of great photo opportunities for the kids which I really liked. I even tried to remember back when we took our son what all photos we took of him. I thought it would be neat to compare them to photos of our daughter there. For me I really enjoyed riding the train, it's a great way to see the park from a different perspective rather than just as you're walking from ride to ride. Plus it was a nice way to relax after we ate lunch. Unlike some theme parks there really weren't very many games for the kids to play. Don't get me wrong I'm not complaining at all, I would much rather spend our day enjoying the rides than playing the games. However I will say my daughter did a heck of a job at the one game she did play. 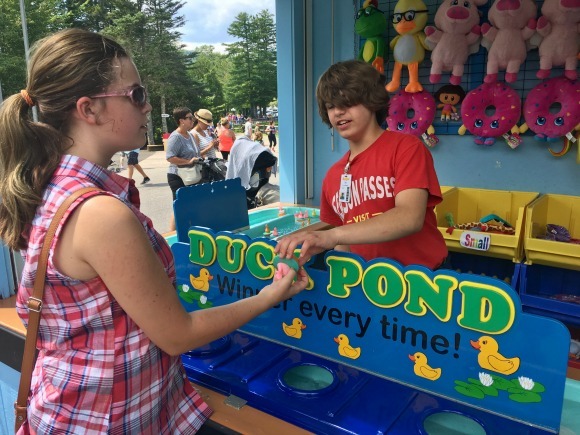 She ended up with a nice sized stuffed wolf playing the duck pond game. I would have to say our day of making memories and bringing fairy-tale stories to life was a big success. We had so much fun together and it gave my daughter and I some time to really bond. Thinking about visiting Story Land? Be sure to check out the special discount offer I have just for you! The rocking horses on the carousel are different and fun! I Have never seen that around where I'm from! These photos are wonderful and Story Land looks like so much fun. I would enjoy visiting there and making wonderful memories also. I LIKE THE PUMPKIN WAGON,THAT'S SO PRETTY. That looks great! My kids would love this place. Such a cute place, I love little small amusement parks like that, very kitch. This is amazing! We had something similar. There were buildings made to reference old nursery rhymes like the shoe and a crooked house. It closed, but the buildings are still there.... it's a bit spooky now. 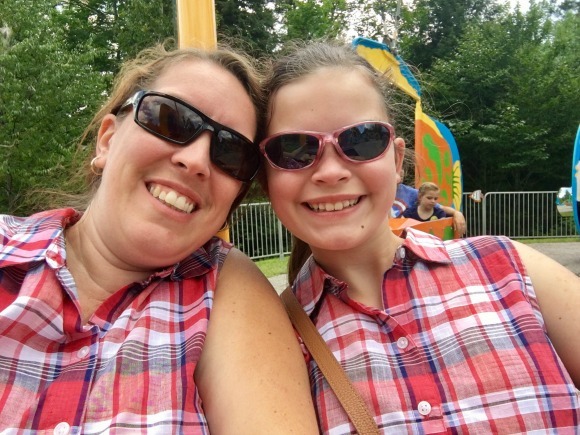 Looks like you all had a wonderful time, I love the mom and daughter shirts and sun glasses, how cool is that.